In the age of smartphones, computers, and digital apps, it can be hard to hold your attention on playing an old-fashioned board game. Board games and card games used to be the primary form of entertainment at family game night. Now, with constant technology development, there are new ways to play your favorite childhood games; on your phone. Many classic game companies are now switching to mobile board games. If you haven’t heard by now, one of the most popular digital board games is Words With Friends. Words With Friends started as the smartphone version of Scrabble, a classic favorite. In Words With Friends, you are able to start a game with another friend, anywhere in the world, who owns a smartphone, and make your moves on your own time. Now that Scrabble too has a popular mobile app, the Scrabble vs. Words With Friends difference (or lack-thereof) is intriguing. The concept of Words With Friends is essentially the same as the Scrabble board game, with a few changes. People enjoy playing Words With Friends because you do not have to be in the same room, let alone same country, to play a game with a friend. It brings you a convenient way to have game night, any time of the week. While playing Words With Friends, you may notice a few obvious or subtle differences between WWF and Scrabble. In most cases, the same words play, so a Scrabble word finder will be just the same as a WWF word finder. In case you’re wondering what these differences are, we have laid them out for you below. Each of the boards have the same number of tiles, but they are laid out differently. 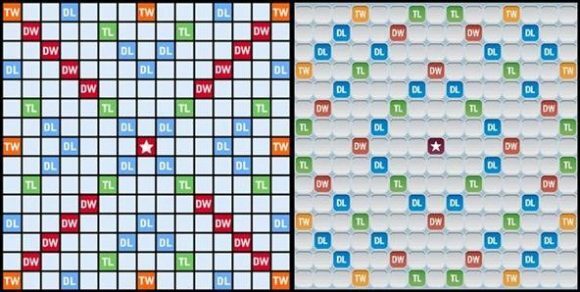 As you can see in the photo below, (Scrabble board on left, Words With Friends on right) they have the same number of tiles. The Words With Friends Double Letter, Triple Letter, and Double Word spaces are laid out in the shape of a diamond, while the Scrabble board’s are in the shape of an X.
Scrabble has 12 Triple Letter squares, and Words With Friends has 16. Scrabble has 17 Double Word Squares while Words With Friends has 12. In Scrabble, the center square is a Double Word Square, while in Words With Friends, the center square is a regular square. There are 100 Scrabble tiles, while Words With Friends has 104. There are 42 vowels and 56 consonants in Scrabble and 44 vowels and 58 consonants in Words With Friends. In Scrabble, you can play a fake or misspelled word if your opponent does not catch it. In Words With Friends, it will not allow you to play a fake or misspelled word (does not apply to online scrabble game). 0 Points – Blank tile. 1 Point – A, E, I, L, N, O, R, S, T and U. 2 Points – D and G.
3 Points – B, C, M and P.
4 Points – F, H, V, W and Y. 8 Points – J and X. 10 Points – Q and Z. The Scrabble tile point values are different from the Words With Friends point values. 1 point – A, E, I, O, R, S, and T.
2 Points – D, L, N, and U. 3 Points – G, H, and Y. 5 Points – K and V.
10 Points – J, Q, and Z. In Words With Friends, the person who begins the game (by selecting “new game” on the screen) invites friends to play, and then plays the first word. So whoever initiates the game, begins first. In Scrabble, the players draw a tile from the bag. The player with a blank tile, or a letter closest to “A” begins the game. In Scrabble, the game ends when one player has used all of their tiles, and there are no more tiles left to draw. In Words With Friends, it ends in the same way, but could also end if three successive turns have occurred with no scoring as long as the score is not zero-zero. There is also the negative point scoring option for leftover tiles of all players. Thus, the end of the game can have a big impact on your final score. These tips on how to improve your Scrabble score can help you out at the end of the game. In Scrabble, you can “challenge” an opponent’s word. If the challenged word is not legal, those tiles return to the player’s hand and that player loses the turn. If a word is challenged and it is legal, meaning it is in the Scrabble word checker, the challenger loses his or her next turn.